I am honored and pleased to announce the addition of Sacred Sekhem™ to my Mother Earth Reiki website. I am the first and only person to receive this attunement, including the only authentic, extensive and informative manuals available anywhere, updated by the founder, Stephen Comee. I received my attunements and initiations into this beautiful and powerful energy system during the Lion’s Gate in August. After working with the energies, I present Sacred Sekhem™ here for you to experience. Is it time for you to ‘re-member’ the healing techniques of Ancient Egypt in this present moment? Sacred Sekhem™ is an energetic healing system that was used in ancient Egypt. It is similar to Reiki, and is drawn from the Infinite Ocean of Love and Mercy. Sekhem is a mysterious system that releases deeply held thought patterns in the physical, emotional (astral), causal, mental and etheric bodies. It is a complete healing system of wisdom that balances both the masculine and feminine energies of power and change. As a tool for transformation it accelerates our personal development and skill at energy healing, aiding us in achieving our full potential. Sekhem works in partnership with your conscious intent, Higher Self, and inner guides. It opens the heart to create a multi-dimensional bridge of ‘at-one-ment’ with Source, giving us pure loving light and a sacred vibrational healing. Using Sacred Sekhem™ helps you find the courage to look honestly at yourself, to go within, and see who and what you really are. You can find the inner inspiration to heal and change those states of consciousness that limit and separate you from your ‘True Self’ and your true purpose as a Soul. This Living Light Energy addresses the subtler aspects of cause, releasing, in the subtle bodies, the deeply held thought forms that create the symptoms of disease that can cause constriction and or blockage of Qi (life energy) in our physical bodies. 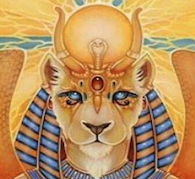 Sacred Sekhem™ is connected to the Goddess Sekhmet, the daughter of Ra. She came forth as the Eye of Ra – the Goddess of Love, Hathor, transmuted into an immense, fiery lioness – the primordial Goddess who took part in creation. Use this energy for more than healing sessions – in your art, poetry, work, music, communication, etc., becoming one with the all empowering energy of Sekhem. This energy is both gentle and extremely powerful. It is thought to have been the power used by the High Priests of Egypt, and perhaps even of Atlantis. Sekhem is a very complex and beautiful system. Please be attuned to at least Level 2 of Usui Reiki or Seichim before you receive these energies.